Spicy Hot Bbuiling and chaffy dish of Chongqing are eponymous famous meal of Sichuan, the seasoning of baiweizhai spires spicy and hot, picked several kinds of high quality raw materials, made refinedly with traditional technology, the product has unique relish, blend with spicy, hot, fresh and delicious as a system and is suitable for popular taste. 1. Add 50g edible vegetable oil. 2. Add 1-2kg water or chicken soup is better and the condiment to pot and boil. 3. It is better first boiling meats then boiling vegetables. Please keep in a cool & dry place. 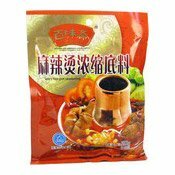 Ingredients: Soybean Oil, Pickled Chilli, Salt, Dried Chilli, Soybean Paste, Ginger, MSG, Sugar, Garlic, Fennel Powder, Chinese Prickly Ash Powder, Spices (Pepper, Star Aniseed, Amomi Cardamomi Fructus, Cinnamon, Bay Leaves, Rhizoma Kaempferiae, Cinnamon), Black Pepper Powder, Aniseed Powder, Rhizoma Kaempferiae Powder, Cinnamon Powder, Disodium 5-Ribonucleotide, Potassium Sorbate (E202).